One thing I noticed about Vegas, it is a very tippy town. Of course it’s also a very tipsy town. 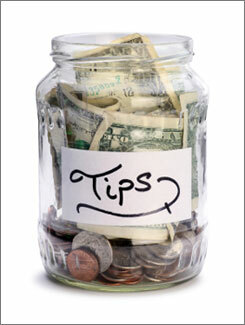 Still, tipping in Vegas is just as common of a practice as drinking in Vegas. The thing is, getting tipsy there is a very simple process and the casinos are very eager and willing to accommodate any who are seeking that type of Vegas experience. Tipping on the other hand, although an easy process to take part in, is a very confusing process for a carry-your-own-bags type of personality such as myself. Here’s what happened, on the second night in Vegas we had reserved a suite at the MGM Grand to do some training for about 20 to 30 people who had gone to Vegas for the same business training that my sweetie-baby-cutie-pie-wifey-pooh had gone there for. After the training, we had some Hawaiian BBQ and a luau party, along with some entertainment. The entertainment… dancers! I know what you are thinking, but the dancing did stay in theme with the party and the dancers wore traditional island outfits and performed traditional island dances in which all of the dancers remained clothed. That in and of itself may seem like a bit of an enigma for Vegas, but for the purpose and theme of the evening it was perfect. The grooviest part of this whole experience was that the hotel was feeling rather randomly generous that day and upgraded our room to a high end suite for no additional cost. When we arrived with all the party supplies we had the bellboy, who was really a bellman but still seemed content on being referred to as a boy that based on his title alone was in charge of ringing the bells for the hotel, unload the car and place all our supplies on a luggage cart. He was very clear that we would not be seeing him again, and that he would not be the one to drop off our luggage at our room. He pointed this out to us three different times. After he filled up a luggage cart we understanding the not so subtle hints he was dropping, tipped him a few dollars and headed to our room. When we got there a completely different “boy” showed up with our luggage cart and proceeded to unload it for us. The main problem I had with this and with loading up the cart was that it just makes me feel a little useless and odd not knowing how to react to the situation. I wanted to help out, because that’s how I was raised, but both “boy ala bells” was very adamant that I do no such thing. After the cart was unloaded the “boy” came over to me asked for the cart ticket we had been given when the cart was first loaded up. I handed it to him with a $5 bill. He looked at the bill and opened it up to see if there was more than one bill inside. When there wasn’t he looked back at me with a “Seriously!? !” look on his face to which I responded, “Thank you!” in one of my friendly tones, and with that he left. It did get me thinking though. Apparently I had taken part in some tipping faux pas. At least when I comes to tipping for your food there is a standard set up that I can mathematically figure out and take part in. I was almost bothered by the “boys” reaction, but we had to quickly get everything set up for the party, and I was responsible for mixing a vat of spirited juice for the attendees. Also, we scored an amazing room. It was around 2200 sq. feet and we were on the 17th floor. 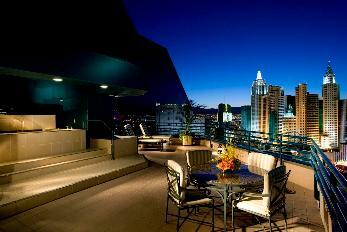 The room had a deck with a fabulous view overlooking the strip, which just so happened to have a hot tub on it. Tipping your server in a restaurant is around 15 to 20% of the cost of your meal. This is a common standard for the US. So how does that equate to baggage handlers? I mean apparently you have to tip the bellboy who unloads your car, and then you tip the bellboy who unloads your luggage cart. You also tip the valet person that takes your car and then you tip them when they return your car. Is there a percentage associated with the tip based on room cost? If there is a scale, what is considered correct? It is 1% or 5% or what exactly? I know it can’t be the same food, mainly because the service you get for the span of a meal could be up anywhere between 30 minutes to 2+ hours. Unloading your baggage cart takes maybe 10 minutes top. Granted there is a bit more heaving lifting, but still. Also, how does this percentage work with upgrades? If I reserve a room that is $200 a night and get upgraded to a room that is $1000 a night, am I then required to tip at the new room rate vs. the original room rate? I don’t think you would, but maybe you are? Does that go along with cars as well? Do you tip a valet guy more if you drive a more expensive car vs. a cheap car? Or is there just one standard fee? Also, with the valet, or even taxis, do you tip more if there are more people in the car? And another thing, we had a cleaning lady show up to get the room ready for bedtime, something I’ve not experienced since I was 5 and my mother would come into my room to tuck me in at night, although this was a bit different. Some nice lady showed up and took away all of the trash from the party. Then she went up to our room and placed some robes on the bed and folded open the sheets to the bed so we could easily climb into bed without having to take an extra second or two to personally grab the corner of the bed sheet and fold it down and then climb into bed. It too was an odd little experience and at the end, it was once again tip time. Once again begging the question, how much do you tip these people? Is this also equated to the cost of the room you are in, or if it is an upgrade do you use the room you were initially intended to be in? Is there an equation that can be used to quickly figure out these sums? Or is it just some standard fee? And while I’m on the topic, I do feel it important to point out that if you are a food server and you take care of a table of 6 or more people (I believe that is the standard) were you automatically add an 18% gratuity and then you intentionally don’t tell the party that in hopes that you’ll get double tips, well then you are an evil, wicked, mean, and bad, and nasty person and I hope you get a severe case facial herpes which always flares around your mouth so that no one will ever want to kiss you again. Sure, some might call that a bit harsh, but I choose to call it suggestive karma. 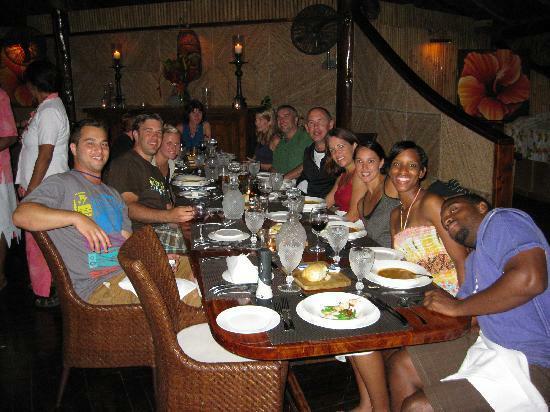 On a different note, but still on the same topic, if you are at a restaurant, and you and your dining party stay for an extended period of time catching up, laughing, telling jokes, sobering up, whatever really, and spend over a three hour period at your table, remember that your server has had to put up with you and serve you for that time and has lost tips because you are taking up a table that someone else could have used for a meal and tipped the server for. The point is you really need to tip them more that the customary 15%. I’d recommend doubling your tip for them. Or if you are one of those people that just meets for coffee at a restaurant and purchase a cup of endless coffee and decide to spend two hours there drinking coffee and ordering nothing else, make sure you drop a dollar or two for each hour you spend there as a tip to your server. It too is a karma issue. Needless to say, Vegas did leave me a little tipped out when we left. 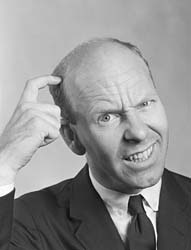 I’m sure there is a cell phone app out there that is more than willing to answer all of my Vegas tipping questions, but that would require me to get a new cell phone that would allow me to add apps to my phone, and that is one gamble that I am just not willing to make. Is anyone else as perplexed by this extended tipping practice, or is it just me? 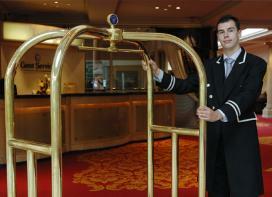 Google Images, key words: tips, bellboy, MGM suite deck, confused man, and friends at dinner. I think it’s always nice to leave a tip, but this feeling of being intimidated into tipping is not nice. …especially if the recipient is not polite and( like your bellboy) is not grateful or gracious on receiving what basically is a gift from a customer. To true, the other oddity about tipping in the US is if you go to a place where they print on the menu that an 18% tip will be added to your bill if you are in a larger group (usually 6 or more people), then you are legally required to tip the server regardless of the service. They can be the worst server on the planet and you are still required to pay them an 18% tip or you can be arrested… hooray for stupid laws! That’s why I’m glad it is grilling season and when we get together with friends, we just go to my place, grill up some food, sit outside, enjoy our meal, our friendships, and some good wine. I love summer evenings for that reason alone.